If you’re on this page, that means you have a puppy. Congratulations on the addition to your family and kudos to you for taking the time to research the best dog food for puppies! Your puppy will grow up healthy, smart, and strong and have you to thank for it. We’re here to show you the most important things to consider. Dog food is a large market and the regulations for quality aren’t as stringent as you might hope. But fear not! We’ll help you weed through the language and give you examples of quality food that anyone would be proud to feed their puppy. Next, know your puppy. Is she going to be big when she grows up? Large breeds differ greatly in their growth compared to smaller breeds. Each present challenges that need to be addressed. Large breeds take longer to mature, but the initial growth is rapid. They need the right amount and ratio of phosphorus and calcium for their bones to develop properly and to prevent joint disease. Overfeeding also can result in severe orthopaedic problems so you also have to pay close attention to caloric intake. Learn more at our post about the best large breed puppy food. Smaller dogs have petite digestive systems. They cannot handle large amounts of foods at one time so feed them a smaller amount more frequently. Otherwise, they run the risk of hypoglycemia. Small dogs also have small mouths. Think of kibble size and don’t buy your tiny puppy food they can’t chew. For more information and recommendations, visit our post about the best puppy food ﻿for small breeds. Now let’s look at ingredients. Marketers of cheap, unhealthy food often use catchy phrases to make you think their product is the best puppy food, but don’t be fooled. Take the time to read the label and we’ll tell you want to see and what you don’t. Protein: This should be the first ingredient. You want to see something specific like chicken, turkey, beef, lamb, bison, duck, etc. It is ok for the word “meal” to follow, but stay away from “by-products.” Avoid general terms like meat, animal, liver, poultry. The use of these words is just a way to hide the real source of the meat. Carbs: Look for whole foods and grains like sweet potatoes, oats, rice, and even corn. Grains get a bad rap because lesser quality brands use poor choices as fillers, but whole grains are actually easily digestible by dogs and offer a great source of carbohydrates. Words to avoid include hull, flour, solubles, product, bran, cereal, and mill run. Lipids: A must here is a source of DHA, an essential fatty acid that is needed for brain, ear, eye, and nervous system development. Again, look for specific fats and oils like salmon oil, flaxseed oil, canola oil, and chicken fat. Avoid general terms like poultry, fish, vegetable, mineral, and animal. Beef tallow is a common source of fat, but it is low in linoleic acid and just generally a cheaper, less nutritious source. Your pup deserves better. Fruits and Veggies: Whole is the keyword here. You want blueberries, apples, peas, etc. Avoid additional words like pomace and pulp. Supplements: Additional supplements can be essential to your puppy’s nutrition. Amino acids and chelates are beneficial. Vitamins (A, B, C, E, and K) are great, but avoid synthetic versions of vitamin K.
Finally, let’s talk about some of the things to avoid outright. These are things like pesticides, binders, coloring agents, additives, flavoring agents, growth hormones, sweeteners, antibiotics, and preservatives. All of these ingredients are at best unnecessary fillers and at worst can be toxic to your dog. Words that you do not want to see on packages include sugar, glyceryl monostearate, phosphoric acid, propylene glycol, BHA, BHT, propyl gallate, ethoxyquin, corn gluten, wheat gluten, flavor, and digest. Now that you know the basics, let’s talk about the different types of food available. 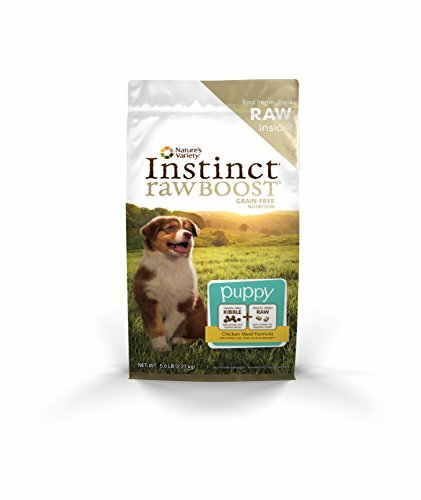 The best puppy food will meet not only your puppy’s needs, but yours as well. Everyone wants the best for their furry friends, but we have to be realistic about price and convenience as well. The basic options are dry food, wet food, and raw food. We’ll also discuss the more subtle categories of organic food, grain-free food, and food for sensitive stomachs. Each choice has its benefits and disadvantages. It’s up to you to make the best decision for your household. The major benefits of dry food are price and convenience. Dry food costs the least compared to wet and raw food. It’s also easy to store and can be left out longer without spoiling. And there is the added benefit of helping to keep your pup’s teeth clean by knocking off some tartar. And we all know how much puppies love to chew! Kibble satisfies at least some of that need (you should still have some designated chew toys around). Some say that wet food is more nutritious, but with higher quality brands, your puppy will get all the nutrition she needs. And if you want more information about dry puppy food, check out our post here. Wet food is more costly and less appealing to handle, but it has benefits as well. It can be a great source of hydration if your puppy isn’t too keen on drinking water. The smell is intoxicating to a puppy (yummy!) so they are more likely to be enthusiastic eaters. Wet food can be a great choice for small breed puppies who have trouble with giant kibble (also, a smaller puppy eats less so you won’t be buying as much as a large breed owner will). Another benefit is that wet food typically contains more proteins and fats, fewer carbs, and no synthetic preservatives. If you'd like to learn more about wet puppy food, please see our post about the best wet puppy food. Feeding dogs raw food is a new trend that has come under a lot of scrutiny. The purpose of the raw food diet is to mirror what a canine would eat out in the wild: fresh, whole, unaltered food. 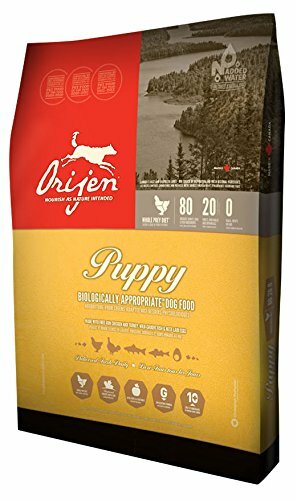 It can be a great choice for your puppy if you choose the right food to ensure complete, proper nutrition. Benefits people have seen include more energy, smaller stools, cleaner teeth, and smoother, shinier coats. There are some things to keep in mind. Raw puppy food may contain bacteria (just like raw meat you buy at the grocery store) and needs to be handled properly. This bacteria will not adversely affect your puppy, but it can make you sick. Wash your hands and dishes used. Since raw is relatively new, you run the risk of an unbalanced diet, but if you study the ingredients, you can avoid this. It’s like any other puppy food; you just have to do your homework to find a safe, healthy choice. Purchasing organic is a great way to keep your puppy healthy and support the environment. Benefits can include better overall health, longer lives, increased immunities, fewer allergies, and easier digestion. A downside is that it probably will be more expensive than a non-organic choice. If you choose organic, pay attention to the wording. It must be USDA certified organic. Natural doesn’t mean anything. Human-grade doesn’t mean anything. 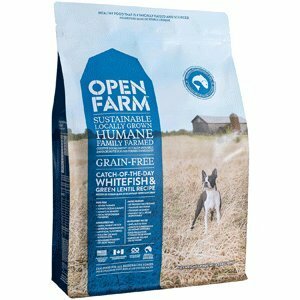 USDA certified organic pet food follows the same guidelines as organic human food so that is what you want. 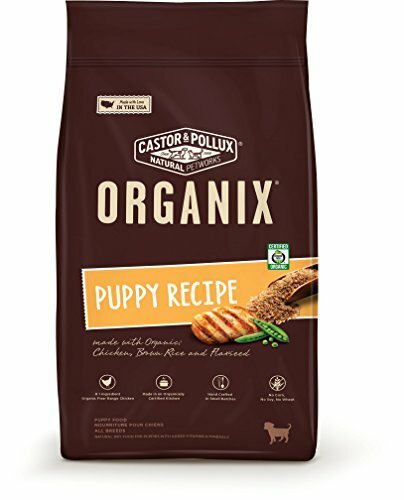 For more information, see our post about organic puppy food. Many people look for grain-free puppy food because dogs can have a harder time digesting and metabolizing cereal grains and complex carbs. This can lead to odorous excrement and damage of the digestive tract. Some dogs are allergic to grains and that’s another reason some people avoid them. An important distinction is that grain-free does not mean carb-free. Carbohydrates are essential nutrients in your puppy’s diet, though you want less grains than proteins and fats. Make sure your grain-free puppy food includes a healthy source of carbs (potatoes, peas, sweet potatoes). If you'd like to learn more about the benefits of choosing a grain-free diet, please see our post on the best grain-free puppy foods. Does your puppy have tummy trouble? Symptoms of a sensitive stomach include eating grass, fatigue, gas, vomiting, and diarrhea. It could be caused by an allergy to an ingredient in your pup’s diet. The first thing to do is to make sure your puppy isn’t eating anything extra (non-edibles inside or outside your house). Then try a new diet with a different source of protein or carbohydrate. Foods with limited ingredients are often good choices to narrow down sensitivities. Remember that switching diets can upset your puppy’s digestion. Give her a week or so to acclimate to the new food. If symptoms are consistent and/or severe, see a vet right away. The same symptoms may be a sign of illness and not just sensitivity. If you'd like to learn more about the symptoms, causes, and solutions, please read our post about puppies with sensitive stomachs. Here is a list of our favorite brands. We’ve chosen them through research of the companies and scrutiny of their ingredients, which we believe is the most important factor. If you’d like to learn more about each of them, please visit our post about puppy food brands. The main priority at Wellness is to do whatever it takes to make the healthiest food for our pets, since they depend on us. Their team includes vets, nutritionists, and animal lovers. They believe real, whole foods make the best ingredients for everyone. 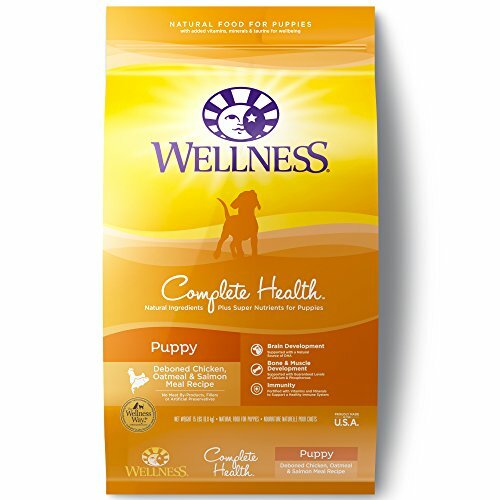 Their history dates back to the 1920s as a dog biscuit company and in the 1990s, the Wellness revolution began and they hired nutritionists, vets, and scientists to create a healthy formula, always discouraging empty calories. 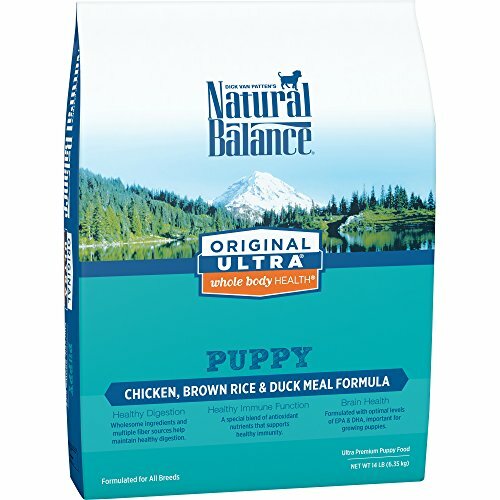 Natural Balance started in the 1980s dedicated to making quality pet food and establishing trusting relationships with their customers. They have many formulas to choose from to make it easy to pick the best for each unique pet. Safety is priority so they have a program called Buy with Confidence that performs tests on their foods against contaminants. 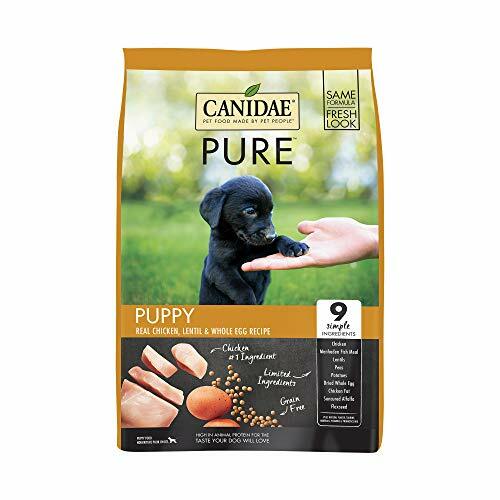 Canidae is pet food made by pet people. It is an independently owned family business cooking up their nutritious food in Texas. They get their quality ingredients from other small businesses. They have an on-site lab for testing to ensure safety and quality. At Blue Buffalo, they consider pets as family, like the rest of us. When their Airedale, Blue, was diagnosed with cancer, they started to really take health and nutrition seriously and began making dog food, making sure they use premium, fresh ingredients. They work with vets and nutritionists to ensure healthy, well-balanced recipes. 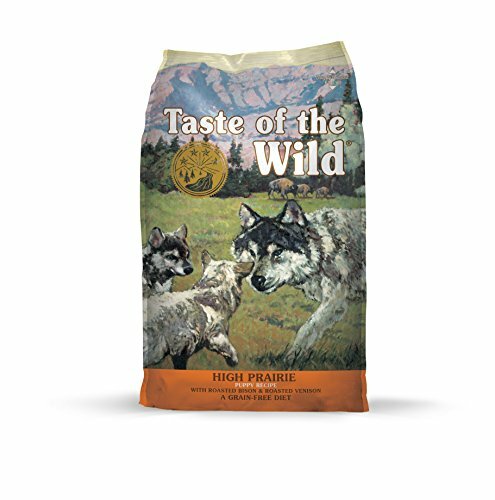 Taste of the Wild bases their recipes on the wild diet of the ancestors of our pets, since their DNA is not so different. They use quality meats and probiotics to maximize nutritional health benefits. Their factories are in California, Missouri, and South Carolina. Now that you know what to look for, we have compiled a list of the top ten best puppy foods for you to consider. Each one is made from a reputable company that uses quality ingredients so your puppy grows up to be a happy, healthy dog. (26% minimum Protein, 12% minimum Fat, 3.5% maximum Fiber, 384 kcal/cup) The main ingredients include organic chicken, chicken meal, organic peas, organic barley, organic brown rice, organic millet, and chicken fat (preserved with mixed tocopherols). (33% minimum Protein, 15% minimum Fat, 5% maximum Fiber, 420 kcal/cup) The main ingredients include chicken meal, peas, chickpeas, tapioca, chicken, chicken eggs, and chicken fat (preserved with mixed tocopherols and citric acid). (27% minimum Protein, 18% minimum Fat, 3.5% maximum Fiber, 417 kcal/cup) The main ingredients include duck, chicken meal, chicken, oatmeal, pearled barley, menhaden fish meal, brown rice, and chicken fat. 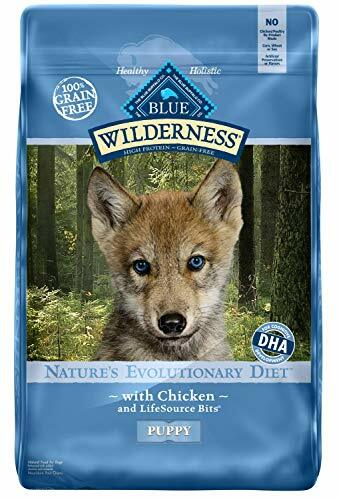 (30% minimum Protein, 14% minimum Fat, 4.5% maximum Fiber, 390 kcal/cup) The main ingredients include ocean caught whitefish, garbanzo beans (chickpeas), ocean caught whitefish meal, field peas, green lentils, ocean caught menhaden fish meal, and coconut oil (preserved with mixed tocopherols). (38% minimum Protein, 20% minimum Fat, 6% maximum Fiber, 451 kcal/cup) The main ingredients include deboned chicken, deboned turkey, yellowtail flounder, whole eggs, whole atlantic mackerel, chicken liver, turkey liver, chicken heart, turkey heart, whole atlantic herring, dehydrated chicken, dehydrated turkey, dehydrated mackerel, dehydrated chicken liver, dehydrated turkey liver, whole green peas, whole navy beans, red lentils, chicken necks, chicken kidney, and chicken fat. When researching to find the answer to the ever important question “What is the best puppy food?”, there are a few important things to consider. First, how big will your puppy grow to be? Different size dogs have different nutritional needs, especially during the growing stages. Second, what is the food made of? Make sure you recognize the ingredients, the first ones listed most of all. Also, the words should be specific; you want to see “chicken” or “turkey” instead of “poultry” and you want to see “salmon” or “mackerel” instead of “fish.” Look at the guaranteed analysis to ensure a solid percentage of protein and fat and a low percentage of fiber. Once you have chosen a food, keep in mind that it will take time for your puppy’s tummy to adjust, no matter the quality of the food. A good strategy is to start by mixing the new food in with the old. First add a small amount. Add a little more each feeding thereafter. After about 7 days, there should be only new food in your pup’s bowl. I would start with the percentage of new food at 10% for a couple days, then 25%, then 50%, then 75%, and finally 100%. This system sets your puppy up for success! As a final note, if you have a pure bred puppy and want information specific to that breed, we may have a post for you. We have posts about the best puppy food for Labrador Retrievers, German Shepherds, and Pit Bulls. If you have any questions, feel free to contact us. We’d be happy to help you in any way we can. Our goal at ReadySetDogs is to provide the best information we can to help you and your puppy have a happy, healthy, successful relationship.